It’s a demonstration recipe that I found on Raw Blends. Interestingly, Vitamix’s Austalia and UK web sites have a version of it, but their US and Canada sites do not. I’m not sure why, since I know plenty of Americans who love Thai food. The analogous demonstration recipe here is Tortilla/Southwest soup, which also does not require extra cooking. It’s nice to have this completely different tasting recipe in the rotation. The flavor is surprisingly Thai-like, without requiring any exotic ingredients. Vitamix CEO Jodi Berg likes to mention that a secret ingredient for Vitamix soup is raw apple. 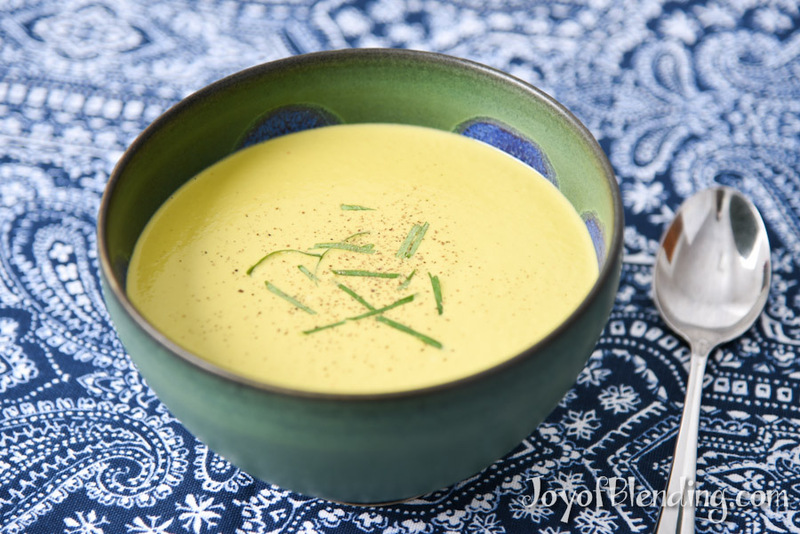 The Vitamix fully purees and heats it, but does not cook it, so it infuses the soup with raw apple flavor in a way that you wouldn’t get in traditionally cooked soups. The same thing happens with other ingredients, but I agree with Jodi that the apple flavor is particularly noteworthy. Makes ~4 cups of soup; 2–4 servings. The only ingredient I cut into pieces is the ginger. It can have fibers that the blender doesn’t cut, so I like to cut it into ~1/8″ thick rounds. If you don’t want it super spicy, you should probably remove some of the seeds of the hot pepper. 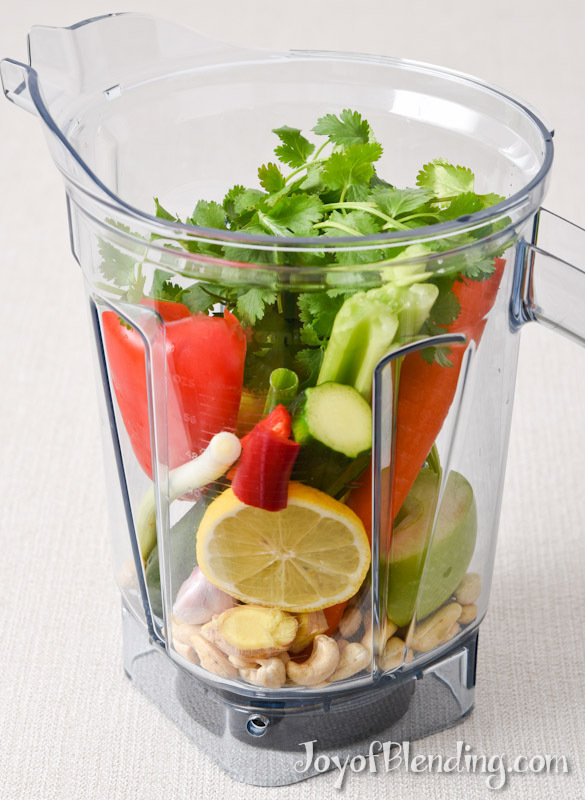 A few go a long way, because they get fully pulverized in the Vitamix. If you start with cold water, you can blend everything on high for ~6 minutes, until it is steaming hot. I prefer to heat the water in a kettle while I’m washing the vegetables. Then you can blend it for ~90 seconds on high, saving time and noise. If you ramp up the speed gradually, you probably won’t need the tamper, especially if you have a wide container. I like the way the chopped cilantro garnish looks, but I wasn’t that into it for eating with the smooth soup. It interrupted the smoothness, without providing something satisfying to chew. I think it would work better on a chunky soup. So you could keep it simple with just the ground pepper, or maybe add some cashew pieces. I bet this would also be good with coconut milk instead of the cashews. You don’t necessarily need each of the first four vegetables. If you have an aversion to one of them, or if you just don’t have it on hand, I think the soup would still come out well. As a demonstration recipe, part of its design is to impress people with the variety of vegetables, and you don’t necessarily need that at home. If you don’t want a totally smooth soup, I think some shredded cabbage would add interesting texture, or you could add something more substantial like baked tofu. You could add either one after blending the soup and then pulse at medium speed to maintain texture. I tested to see what it was like after leaving some in the fridge for a day. It was fine, but it lost a lot of its fresh flavor, so I’d recommend eating it right away. Normally I would take garlic out of its skin, but it turns out that the skin is completely undetectable in the finished blended soup. Ginger peel also blends to oblivion. I normally don’t blend lemon peel, but this tastes good with it. I think the peel may add to the Thai-style flavor in this recipe by approximating lemongrass. 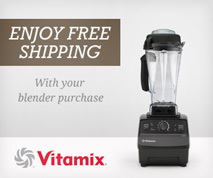 I REALLY enjoy and benefit from these emails, with versions of latest VitaMix in both our homes. Could you please add a button to enable printing the recipe only, so I don’t have to both print and read thru your descriptive text when I simply want to follow .. and enjoy.. one of your great recipes ? Carl, I would agree that a Print button would be very helpful. On this particular recipe, I was able to do a Print Preview, find the recipe (on page 2), and print only that page. A bit of a process, but well worth it for a wonderful recipe. Hope this helps. This DOES help. Thang Kew !! Making a print button is on my to-do list, but honestly it’s not that near the top. Thanks CMFifer for the helpful suggestion! The other thing you can do is select/highlight the part that you want to print. Many web browsers have an option in the print dialog to only print the selection. Or you can also copy and paste the part you want into a blank document on your computer (like Word or Notepad). If that is not an option, there are also online blank text boxes you can paste into, such as http://www.editpad.org/. This soup is delicious! I’ve already made it twice, with slightly different ingredients. I used coconut milk and chicken broth for the liquid, instead of water and the veggie bouillon, with a slightly smaller quantity of cashews. If you don’t approve of chicken broth, I’m sure it would be delicious with just coconut milk. I also threw in a bit of kale and some raw cauliflower instead of the zucchini and green pepper. Honestly, I think any combination of veggies will work perfectly in this, since the flavoring comes primarily from the combination of lemon, garlic, ginger, hot pepper and cilantro. (You can use quite a lot of cilantro.) I suspect it would be great with lime instead of lemon, but I haven’t tried that yet; also, for non-vegetarians, I’m guessing a bit of Thai fish sauce would make it pop even more. All in all, this is a great recipe – you don’t have to follow it exactly, and many of the ingredients can be substituted out for whatever you have in the fridge. My personal opinion is that, while it’s pretty cool that you can heat the soup in the vitamix without getting a pot dirty, it’s not really that much of an advantage – I found the noise oppressive, and preferred to blend and then heat it on the stove, without boiling. Great suggestions! The one thing I would be wary of is the strong bitter taste of raw kale (and possibly raw cauliflower) dominating the flavor. But I bet it would be fine with a delicate young kale, or maybe just putting in a small amount. I was curious and tried adding kale. I added 3 smallish leaves (not super young), and found that they made the soup too bitter, to the point of being unpleasant. I chilled some of the batch, and that made it more palatable by muting the bitterness. I don’t think I’ll add kale again unless it’s a baby kale. I just made this about 15 minutes ago. It is so delicious! I am going to try it with kale and spinach too. I also thought to spiralize some zucchini and use them as noodles to see what it would be like. Thank you so much for this recipe! I really like vitamix recipes without lots of other cooking to be done first. Zucchini noodles sounds like a great idea to add some texture! I don’t know if you saw the comment above yours, but I found kale kind of ruined the soup (baby kale might be fine). Made this Soup couple days ago… Took it to work, the day I made it, loved by all who tried it with Crushed Tortilla Chips sprinkled on instead of Soda Crackers. I had some left over… Warmed it up tonight & used it as a Pasta Sauce, Amazing… Next time I make it… I’m making it a bit thicker & using it as a Dip for Tortilla Chips… Love this recipe, so versatile. Cashews thicken the soup that is why you ended up with a watery mess especially since a 3/4 cup omission is a lot. I enjoyed this made exactly as the recipe was written. However, I am thinking that it would also be great adding some steamed shrimp, baby corn and toasted coconut flakes on top of an ancient grain mixture. This was totally filling! My substitutions were to use Thai chili instead of bell pepper but it was way too hot! So I’ve been leaving out pepper altogether until I get another Thai chili and then I will use a tiny piece for it. I’m from the south and okra and shrimp are in season now, so I sauté those with mushrooms and onions and add to the soup after I whirl it for a heartier soup. Delicious! This was fantastic! I added a little extra garlic and subbed the zucchini out for cauliflower. Texture was dreamy! I just want to thank you for all your recipes and your tips, I now make your recipes every day which are insanely better than the original Vitamix recipes from their book. Everything just taste so good and the texture is perfect. I’m glad to hear that you are enjoying my recipes!